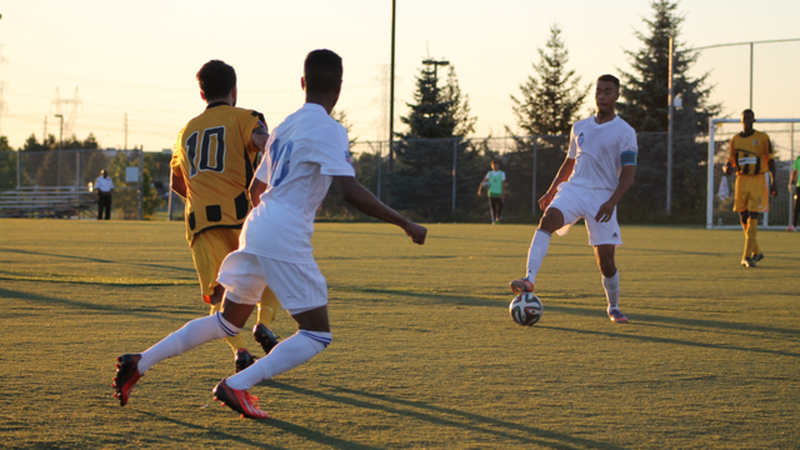 In a battle between two lower-tier League1 Ontario teams looking to move up the table, it was ANB Futbol that took advantage of mistakes to come up with a tidy 3-0 win over Durham United FC on Sunday night. The match featured some slick play and plenty of chances for the home side which moved the ball quickly and efficiently around the Ontario Soccer Centre pitch. For the most part it was left to DUFC to do the chasing. The back four of United had a tough time containing Mills' brothers Brandon, Jason and Jahsua as well as striker Belrum Vartanian, who broke free frequently to attack the Durham goal. The teams were stalemated in the early going, but as the match wore-on ANB’s speed and athleticism began to show, as first Vartanian drew a great save from Durham keeper Eugene Alves, and then Jason Mills drilled a shot off the post. It was only a matter of time before ANB hit the scoresheet. It did in the thirty-eighth minute, on a well-worked goal, as back Raheem Edwards fed Jahsua Edwards, and then headed toward goal, got the ball back and slipped it into an open net. Right on halftime, Jason Mills finally scored his opener of the season, getting by Alves and sliding it home to make it 2-0 at halftime. Vartanian made it 3-0 on a well-taken penalty in the second half as Durham United took very few chances at the other end. That earned seventeen-year-old keeper Ali Ghazanfari a clean sheet for ANB. The victory leapfrogged ANB past Durham from eighth to seventh place with eleven points from ten matches. Durham has ten points after twelve matches. For ANB coach, Marcelo Almeida, the victory comes on the back of having plenty of young players in the lineup. “Finally we got three points and a shutout which was good. We had a very young team out tonight and some injuries. We had some players who had never played in the league before,” said Almeida. The coach was pleased that forward Jason Mills was able to find the net after having so many chances throughout the season. For Jason Mills, who forms an effective attacking trio with his brothers, the match was a chance to show what they can do in concert with their teammates. “I think we moved the ball well, we controlled it when we had to, we knew that we were technically stronger than they were and that was our game plan coming into the game,” said Jason Mills. Jason Mills said he believed he could have found the net at least once more during the game but will try to score more in the last half-dozen games. “Oh yeah, I think I could have had more than one. I should take more chances myself individually, maybe I’ll save that for next game,” he said. The forward believes his side can finish in the top five if it continues to get results over the final six games. ANB is scheduled to head to Kingston for a match on Friday at 8:45 p.m. while Durham plays Masters FA Saints at L’Amoureux in Scarborough on Saturday at 3 p.m.